The Los Angeles County Civil Grand Jury issued their 2012-2013 report, which included a very detailed 71 pages (page 85-156) section entitled “Cities of Los Angeles County: Fiscal Health, Governance, Financial Management and Compensation”. The City of Diamond Bar needs to brush up their fiscal health and best practices, because the city was ranked 64 of the 88 cities for “number of positive responses”. 1) Adopt financial planning, revenue and expenditure policies to guide city officials to develop sustainable, balanced budgets. 2) Develop a balanced budget and commit to operate within the budget constraints. 3) Should commit to not using one time revenues to fund recurring or on going expenditures. 4) Should develop specific annual goals for the city’s executive. 5) Should formally establish an audit committee making it directly responsible for the work of the independent auditor. 6) Should undertake a full scale competitive process every 5 years for the selection of an independent external auditor. The general demand by the public for transparency of financial matters regarding their local government has been increasing overtime and Diamond Bar is no different, which the Los Angeles Civil Grand Jury has highlighted the various concerns addressed to the 88 cities throughout the county. It is imperative for the City of Diamond Bar to take corrective action on the Civil Grand Jury recommendations to ensure internal controls are in place with regards to fiscal health and governance best practices. If no one is watching how their local government spends those tax dollars, then who will. It is best to ask questions now, than later with regrets. We surely hope that the Diamond Bar City Council takes the Civil Grand Jury key points with seriousness and not brush it off by putting the report on a shelf to collect dust. 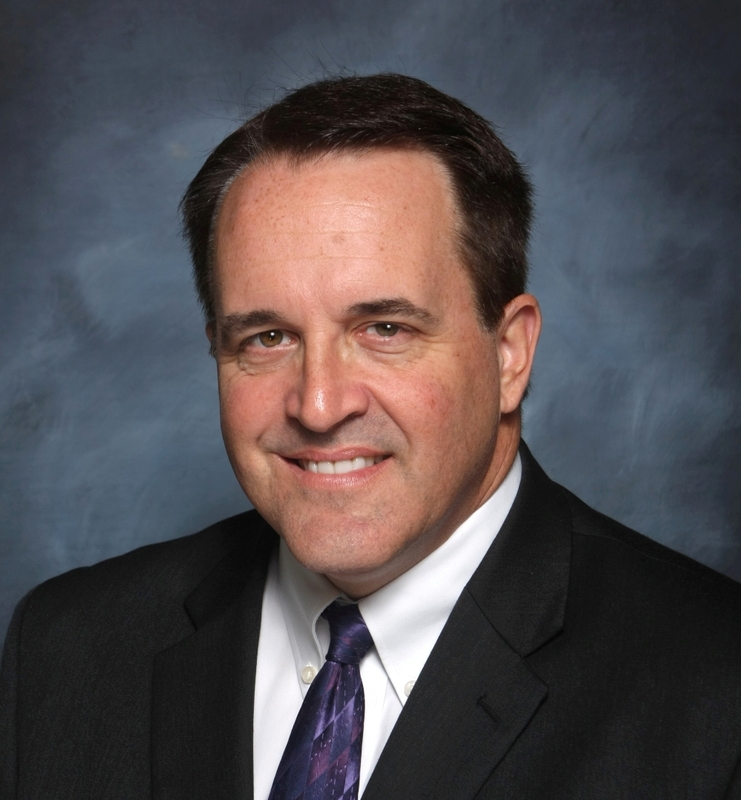 ORANGE COUNTY, CA – San Clemente Mayor Bob Baker joins San Clemente Mayor Pro Tem Tim Brown in endorsing Laguna Niguel Mayor Robert Ming for Orange County Supervisor. Ming is running for the Fifth District Supervisor’s seat being vacated in 2014 by the term-limited Patricia Bates. Baker and Brown join the growing list of local elected leaders from within the 5th District who have endorsed Ming for Supervisor. “Robert understands the importance of local control and the fact that each south county city has unique needs,” Baker said. “San Clemente can count on Robert Ming to meet our residents’ transportation and open space needs, while keeping government spending under control.” Mayor Baker joins San Clemente Mayor Pro Tem Tim Brown in endorsing Robert Ming for Supervisor. Born and raised in Orange County, Mayor Robert Ming and his wife Susie have been married for 21 years and have four children. The Fifth District includes the South County cities of Aliso Viejo, Dana Point, Laguna Beach, Laguna Hills, Laguna Niguel, Laguna Woods, Lake Forest, Mission Viejo, Rancho Santa Margarita, San Clemente, and San Juan Capistrano, along with the community of Shady Canyon in the City of Irvine and the unincorporated communities of Coto de Caza, Ladera Ranch, Las Flores, and Wagon Wheel. Paid for by Ming for Supervisor 2014. ID#1358874. I have long felt that John McCain is neither a conservative nor a liberal but a politician of the Party of John McCain. He goes off on his own tangents sometimes advocating a position I agree with but most often not. However his performance in the Senate this week and the statements he made about Sen. Ted Cruz and Obamacare were over the top and I believe a fundamental disconnect for him from his role as a Senator from Arizona. Rather than just quietly voting for the close of debate after Sen. Cruz finished his filibuster, Sen. McCain essentially stated on the Senate floor that because President Obama was reelected we just have to accept Obamacare as is. Ben Shaprio over at Breitbart has a short and well written post about this at http://www.breitbart.com/Big-Government/2013/09/25/McCain-bashes-Cruz I recommend it to you. As Mr. Shaprio noted, I guess the people of Arizona did not know they re-elected John McCain to not advocate legislation to fix or replace Obamacare but just accept it as is. And to call how the bill was passed “fair” is to ignore history. In addition Sen. McCain is giving a pass to President Obama for all of his unconstitutional exemptions and postponements of Obamacare’s requirements to big business, labor groups, anyone working inside the Capital dome but not the American people (no exemption of the “individual mandate”). These types of edicts / exemptions by President Obama are more in line with a banana republic than a country where the elected leaders respect the rule of law and U.S. Constitution. Sen. McCain should have been challenging the President and the Democrats over these unconstitutional edicts and not rubber stamping those actions by going a long with Harry Reid. What Sen. Cruz was doing was not just about Obamacare (which is bad enough) but about whether we as a people are going to push back against a President who rules by edict and ignores and flaunts the U.S. Constitution. Sen. Cruz was calling the President out on this as well and Republican Senators should have been joining him in at least adding their voices against this threat to the rule of law! I hope the people of Arizona are seeing this and will find a better representative when Mr. McCain is up for re-election. California businesses should hang onto their pocketbooks if Solorio ever holds legislative office again. Already known as one of the biggest job-killers in the Assembly (As previously profiled by the Solorio Scoop), businesses shouldn’t be all too surprised that Solorio wants them to finance California’s spending problems. As an Assemblyman, Solorio voted to blamed Prop 13 for California’s budget problems. Struggling California businesses can be certain that a big spender like Jose Solorio wants them to finance his spending problems. COME ENJOY A FRIDAY NIGHT SHOOT OUT WITH MAYOR ROBERT MING! 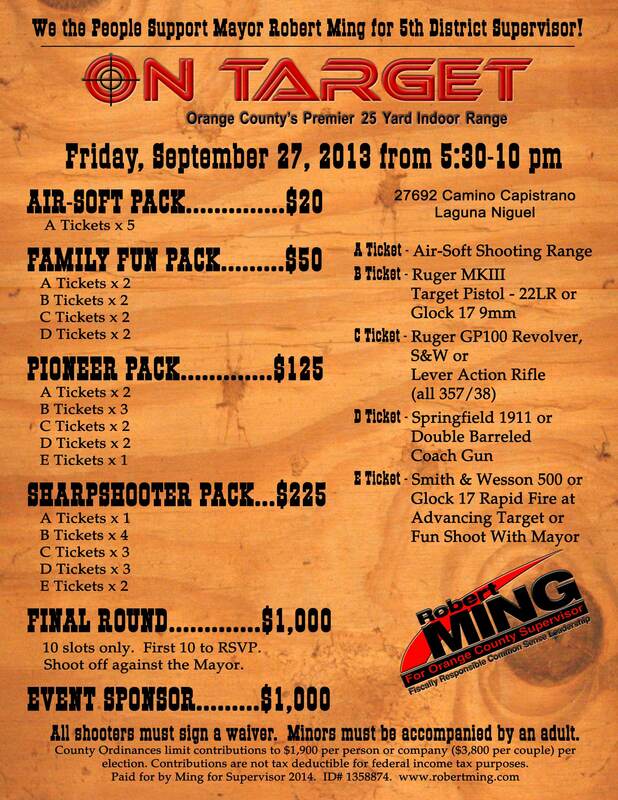 Come join Laguna Niguel Mayor Robert Ming for a fun time at the On Target range (27692 Camino Capistrano, Laguna Niguel, CA: 949-348-0352: http://www.ontargetrange.com ) on Friday night September 27, 2013! 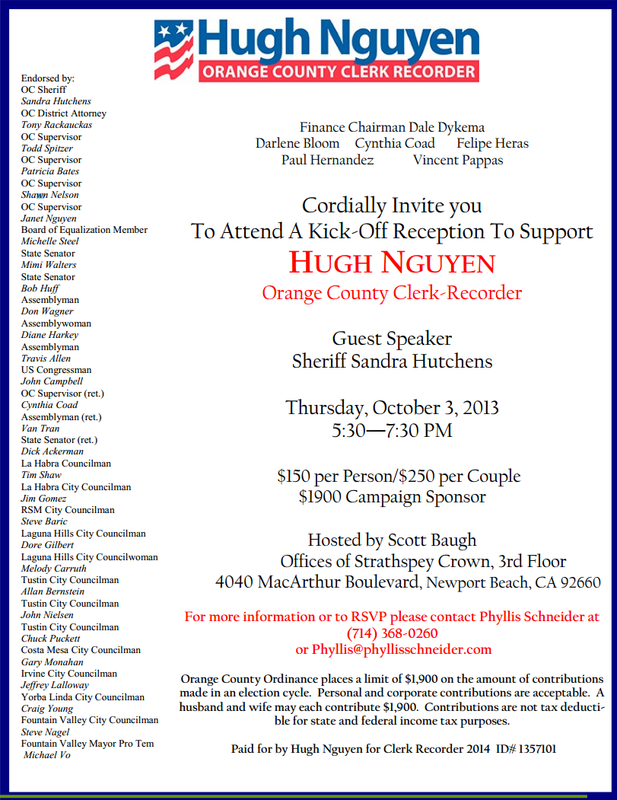 As noted in my post on this subject earlier this week, this event will be a fund raiser and friend raiser for Robert’s race for the 5th District Supervisor of Orange County (current Supervisor and good friend Pat Bates is termed out next year). Sign up and come down for a great time, good friends and celebration of our 2nd Amendment rights with Mayor Robert Ming. Robert will even give you his positions on the issues (and for those of you who have been reading blogs posts here recently: even his opinion on spending taxpayer money for a High Speed Rail system – hint: Robert is a proven movement fiscal conservative!). In true blogosphere fashion, I fully intend to respond to David Bahnsen’s response to my original post about the Lincoln Club’s endorsement of Robert Ming for the Board of Supes – but I simply do not have time today. 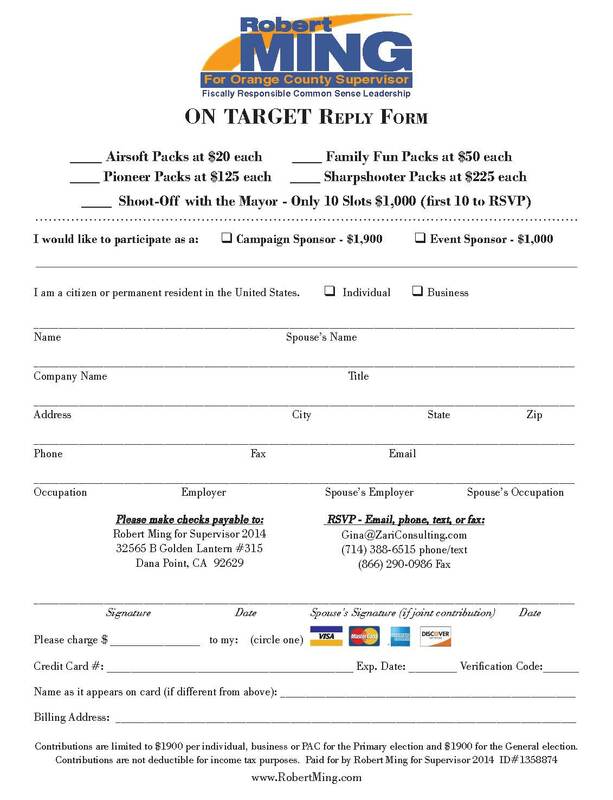 However, I do want to address a directly related issue: the false rumor being spread that the other candidate in the race, Mission Viejo Council Frank Ury, is an advocate of high speed rail. Bahnsen made that claim here and on his own blog — which he has now retracted. At the Lincoln Club Board of Directors meeting where Ming spoke and was endorsed, the members were left with the false impression that Frank supports the high speed rail project (and this is according to Club members who were there). This is manifestly false. in fact, the opposite is true: Frank is opposed to the high speed rail project. He is on record as opposing it. Here’s an example: at the February 20, 2012 meeting of the Mission Viejo City Council, Frank voted in favor of a resolution of support for Assemblywoman Diane Harkey’s bill to defund CHSR. Since he was mayor that year, Frank even signed the official resolution in favor of defunding CHSR. Let me re-state the truth for the benefit of the hard-of-thinking: Frank Ury opposes the high speed rail project. There are only two announced candidates for the 5th Supervisor District. Both are conservatives. Neither has been in the race very long. And already minions or supporters of one are spreading a false rumor about the other. Rumors don’t spontaneously generate out of thin air. People start them for a reason. Judging from people I have spoken with, this particular one has its genesis from the fact that some of Frank Ury’s supporters have also supported CHSR. Therefore, their illogical thinking goes, Frank must also support. I find it amazing that otherwise intelligent people who ought to know better would fall for such thinking. That’s like saying that because you are endorsed by say, the Lincoln Club of Orange County, then you automatically support every other Club-endorsed candidate and their positions – or every position the Club takes, such as its bold (and correct) immigration reform policy. Of course, that would be false and faulty logic. Worse are instances of people who know this rumor is not true – or ought to know but don’t bother to find out — and spread it anyway in hopes of undermining Frank’s campaign. I’ve known Julie and Phil for nearly two decades and have long admired their leadership on behalf of conservative causes. Thank you, Julie and Phil, for your support. You can join Julie, Phil and other supporters of my campaign tonight at my kickoff fundraiser at the home of Laguna Hills Councilman Andrew and Michelle Blount. Please see the invitation in case you want more information. To RSVP, please call Julie Paule at (951) 325-8040 or email Julie@pauleconsulting.com. Please visit www.frank4oc.com to learn more about my campaign and see the comprehensive list of Republican, business and community leaders endorsing me.